Say habari, the Swahili word for hello, to the wild yet feminine Gloria for Classic Miche Bags. 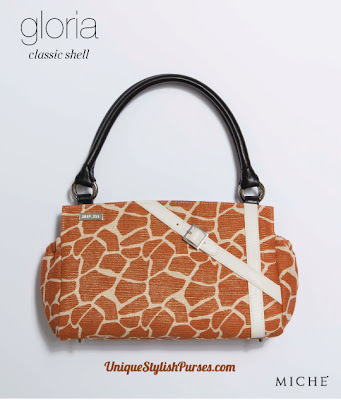 Cream and orange giraffe-print canvas features faux leather “belt” accent with silver buckle detailing. The pièce de résistance? Rich gold threading throughout the fabric means Gloria glistens like a setting African sun. End pockets.